Fantasy cricket games are quite trending these days. India is a cricket loving nation, everybody knows that very well. I bet, during school days, almost everyone would have said that cricket is my favorite game…correct me if I’m wrong..Haha. But do you know, now you can do much more with cricket than just watching it on TV? Yes! Now get ready to make some real cash during this IPL season. But how do I do that? Wait, I’m here to tell everything in detail. Just keep on reading. So, as the title suggests, this post is all about Dream11. 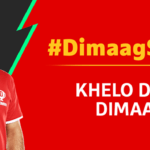 Lately you might have seen some Dream11 ads on TV featuring M.S. Dhoni and since then people have started taking interest in it. Below we have added detailed steps about winning free cash on dream11 app. 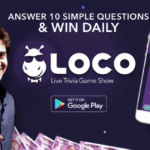 Dream11 Refer Code : Get 100 Rs Bonus Now! Download Dream11 app in your phone. At the bottom, you will see this option – “Have a referral code? Enter code”. Checkout the snap shown below. Now on the next page, you have to enter LENOV317OP (all capitals) as shown below. Remember to enter the code because you won’t be able to redeem it afterwards. Then fill your mobile number, email id & password. Now you will get Rs 100 bonus immediately for using above dream11 refer code. 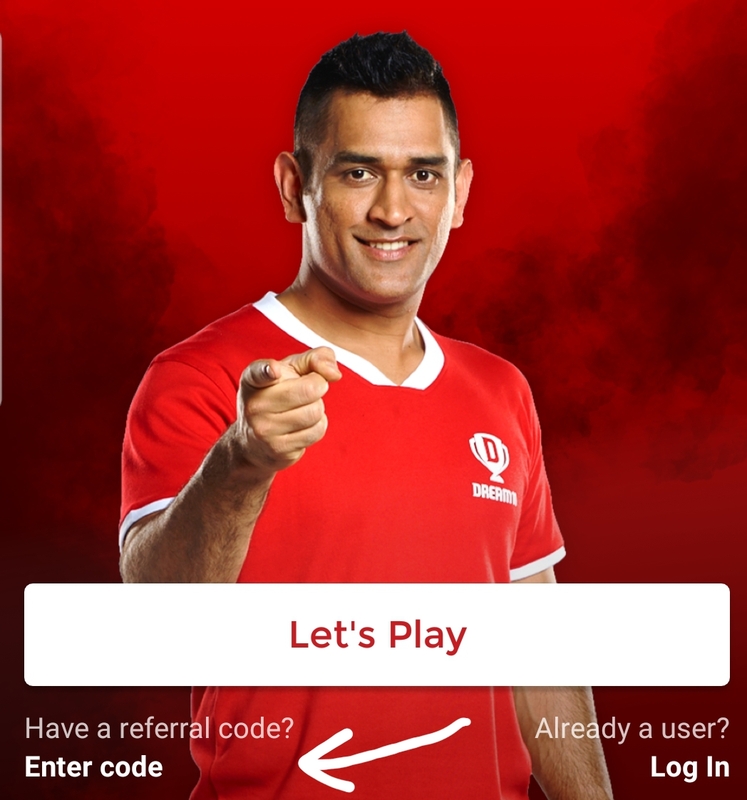 How to Refer Friends in Dream11? On the home page itself, you will find the banner of ‘referral rewards’. If it is not there, then go to ‘ME’ tab. Scroll down till end until you see ‘Invite Friends & Get 100’ option. 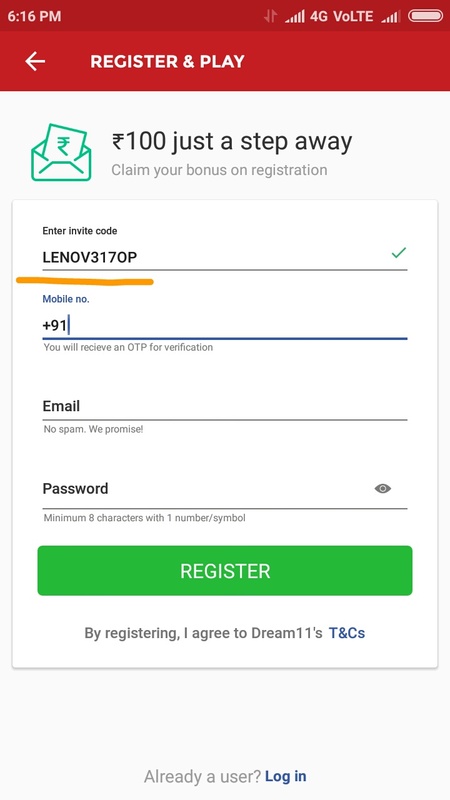 Once you have your unique referral code, ask your friends to use it while signing up. You will get 1/3rd amount of their game fee. That means, if they participate in a contest by paying fees of 30 Rs, then you will earn 10 Rs. Read These Important Terms & Conditions! You can earn unlimited cash by referring friends. All the referral amount will go into “cash bonus” and not in “unutilized” or “winnings”. This means, you can only use your referral cash for playing in contests. It can not be withdrawn into bank. You can use 10% or Rs 25 (whichever is higher) for participating in contest. For example, if entry fee is 50 Rs, you will get 25 Rs discount provided that you have sufficient funds in “cash bonus”. Rest money, you will have to pay via paytm or suitable payment method. All the earnings can be redeemed into your bank account. Isn’t that cool? Do let me know if you have any other concerns. Thanks for reading and do check out our other posts too!